Raphaella SMITS plays Johann Kaspar MERTZ and Mauro GIULIANI. "In the first half of the 19th century Vienna was the musical centre of the world, and certainly a centre for the guitar as well. The “Viennese Classic” is the interweaving of the Italian bel canto and the German romantic. There were many musical evenings where the most outstanding guitarists made their appearance before the elite of Vienna: among them Mauro Giuliani from Naples and Johann-Kaspar Mertz from Pressburg (now Bratislava). The guitar clearly enjoyed an enormous popularity. "For me Giuliani is a Haydn-Mozartian composer, a model of good style, well-balanced in form and harmony. His Sonata forms a superb example of it, in which he just happens to use the guitar as an instrument, as a medium for his universal music. No wonder he was a celebrity during his stay in Vienna. 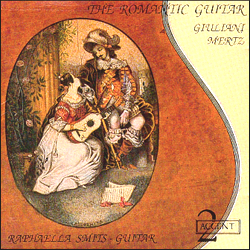 Read also Pieter Andriessen's interesting comparison of 'The Romantic Guitar' with 'Harmonie du soir', Raphaella's second Mertz-Giuliani album of 2003. "Pure perfection and a beautiful atmosphere. This CD is a gem!" "In some pieces of Mertz, there is so much sensuality that one believes hearing Chopin at the guitar." "Smits again proves her mastery by combining exceptional fluid phrasing with a keen sense of dynamics." "Raphaella Smits grants these compositions a well-cared-for interpretation, musical refinement and a beautiful range of timbre and expression. With this recording she proves she acquired the grandmastership of the instrument." "Raphaella Smits (the sadly unnamed-by-Amazon guitarist on this recording) is a competent player with a lush, expansive tone and panache for grand, romantic interpretation. This approach to Mertz is absolutely gorgeous." "Raphaella Smits presents an emotionally experienced and a sonorous varied performance, showing at the same time a refined sense of style." "Die CD bietet Gelegenheit, einen der kreativsten Komponisten für Gitarre weiderzuentdecken. Raphaella Smits spielt mit großem Einfühlungsvermögen."